Explore the Changes for the Upcoming 2017 Dodge Viper! What Changes Can You Expect for the 2017 Dodge Viper? Fiat Chrysler have recently announced the changes to be made for the 2017 Dodge Viper, and the Viper keeps its spot at the top of the premium sports car category. While the new Dodge sports car will mark the Viper’s last year, Dodge has gone out with a bang, with six special edition models planned for the vehicle’s swansong year. This year marks the 25th anniversary of the legendary Viper. One of the most impressive and envy-inducing nameplates in the world for a solid quarter-century, the Viper is an expression of pure driving joy. From the classic white on blue color combination (designed after the 1998 Viper GTS-R GT2 Championship Edition) to the eye-catching green hue of the Snakeskin models, these special editions are already attracting particular interest. Of course, even the standard models are anything but standard. At the heart of each sits a mighty 8.4L V10 engine that puts drivers in command of up to 645 hp and 600 lb-ft of torque. The latest Viper even boasts a more responsive drive than ever before thanks to adjustable stability control, traction control, and a 4-channel anti-lock brake system, making the best even better. We’re sad to be seeing the Dodge Viper go, but at least it’s leaving at the top of its field. To find out more about this iconic model, contact our team at Findlay Chrysler Dodge Jeep Ram. 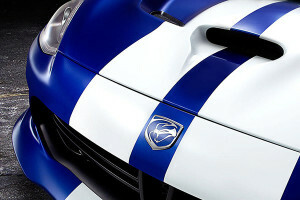 0 comment(s) so far on What Changes Can You Expect for the 2017 Dodge Viper?